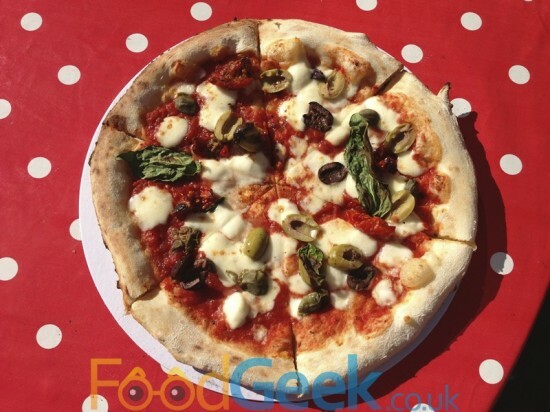 Despite raining for most of the previous week the sun was actually shining in Manchester on Saturday, the perfect weather for eating amazing food in the street. 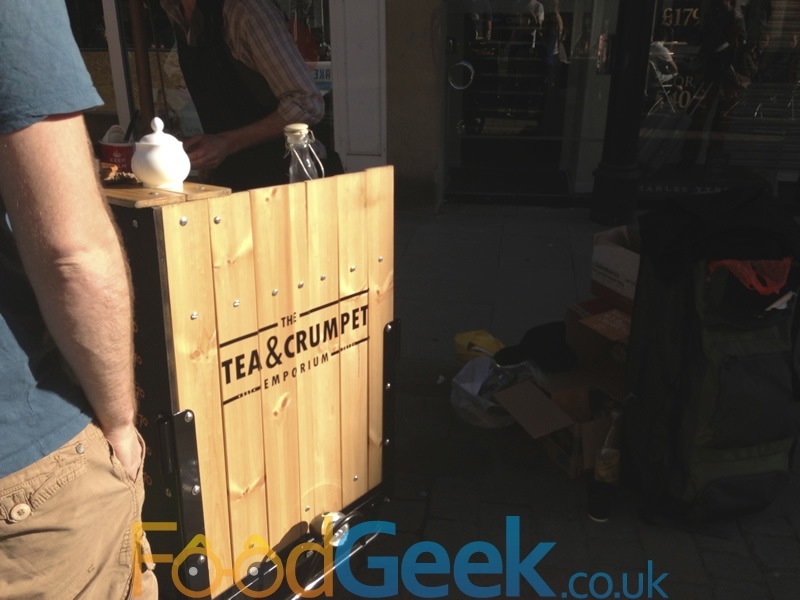 So I headed excitedly to the city centre where Guerrilla Eats had taken over King Street. Guerrilla Eats is a collective of street food traders who run one off events at various venues around the Manchester area. 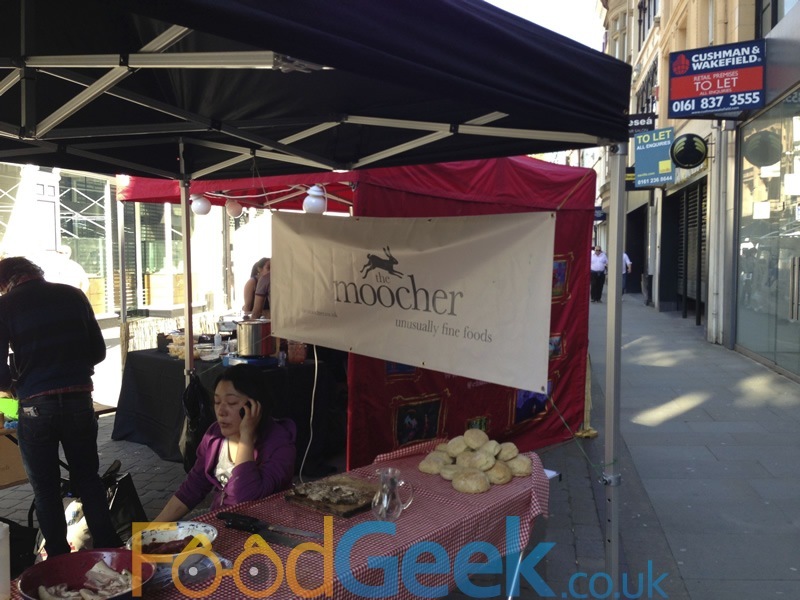 This time the traders included lots of names i’ve become familiar with recently including Dirty Dogs, Pancake Corner and Chaat Cart who were recently featured in Jamie Oliver’s magazine! I was in my element when I arrived and wanted to try as much as possible but didn’t know where to start. 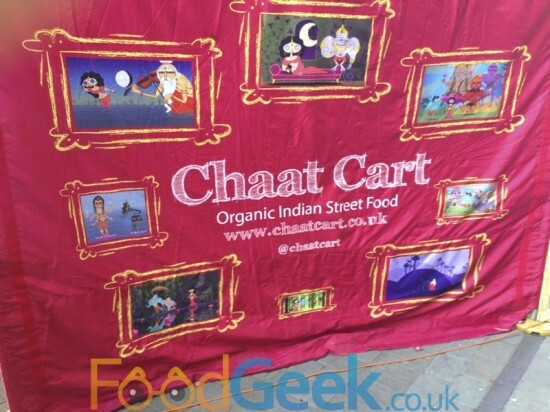 The amazing aroma of Indian spices soon made my mind up so I headed for Chaat Cart. It seemed like everybody else had the same idea as they had by far the biggest queue. The queue for Chaat Cart was moving slowly and we were being teased by the tempting smell of barbecued pork belly from the stall next door run by ‘The Moocher’. I can’t resist pork belly so sent Mrs FG over to investigate. She returned with an amazing charred pork belly & mustard sandwich which tasted every bit as good as it smelled. 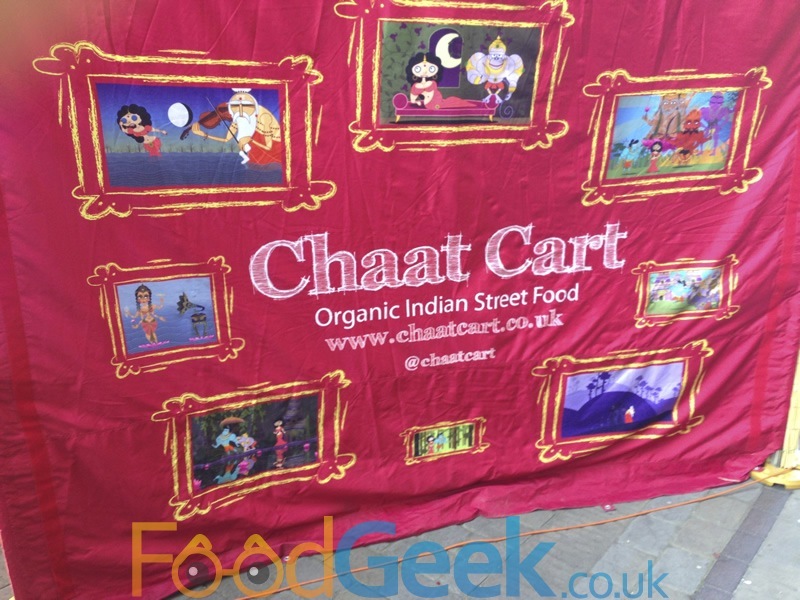 We finished just in time to collect our Indian street food goodies from Chaat Cart. I went for the Chaat Thali a selection of small snacks including a samosa, bhel puri and a few pots of delicious things. I have no idea what they were except one was made of chickpeas but they were all delicious with a range of interesting spices. I also ordered a Masala Dosa, a savoury pancake filled with a spicy potato mixture which was also good. Unfortunately I was so eager to tuck in that I forgot to photograph them, oops! Next, I visited the ‘Fire And Salt BBQ’ stall and bought a ‘Chopped BBQ Pork Roll’, slow cooked pulled pork in a soft roll with homemade smokey BBQ sauce. 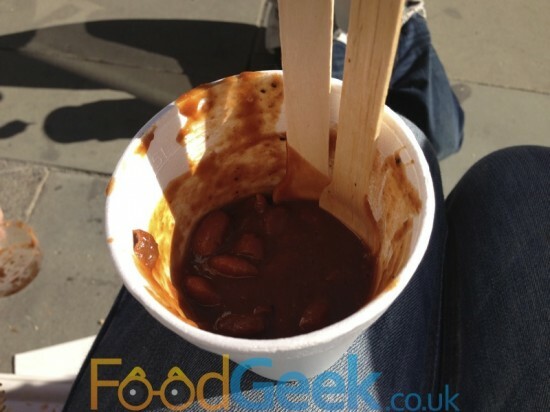 It was good but the black treacle BBQ beans were even better, so good I went back for more. Annoyingly we were starting to get full already but there was still so much left to taste! Thankfully I remembered my good friend alcohol has a habit of making me very hungry so after a couple of ciders from the popup bar we were ready to go again. 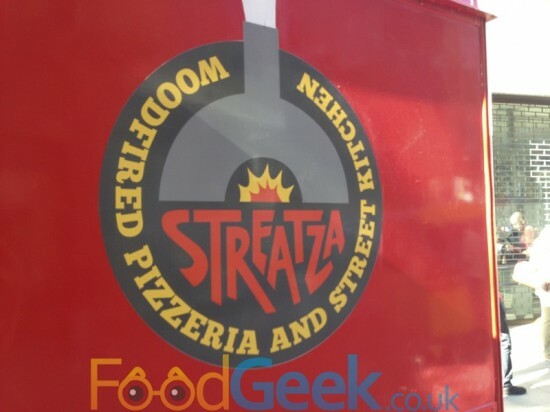 Another gorgeous aroma decided what we’d eat next, this time pizza from Streatza. A classic 1969 Citroen van that features a proper wood fire oven in the back! I was disappointed that they’d run out of Nduja, my favourite spicy sausage but happily ordered a ‘Napoli’ instead. Five minutes later I was tucking into one of the best pizzas i’ve ever eaten, seriously. The olives, capers, basil and stringy melted mozarella were great but it was all about the base which was just incredible. Not only was it perfectly thin like a traditional Italian pizza but it tasted fantastic too. 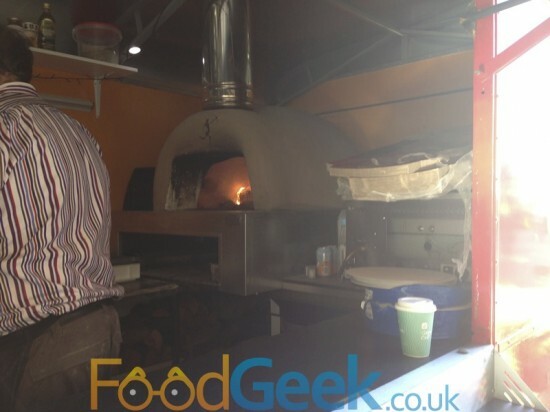 I remembered seeing a sign proudly claiming that they make their own dough and let it develop slowly for 24 – 72 hours, all I can say is whatever they’re doing clearly works as it was amazing and put many restaurant pizzas to shame yet was cooked in 5 minutes in the back of a van. We were getting full again and being sure to leave room for dessert had to reluctantly pass on a hot dog from ‘Dirty Dogs’ though they looked really good. 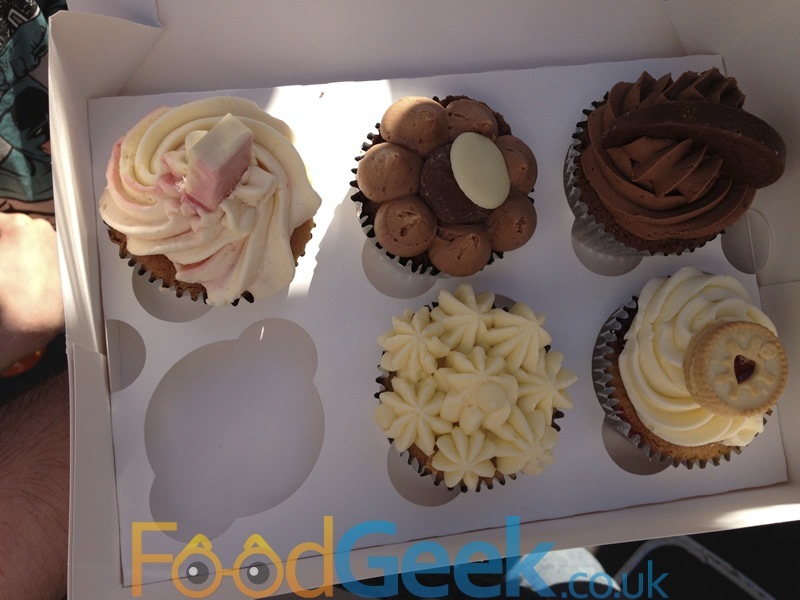 Dessert was a choice between pancakes from Pancake Corner or cupcakes from ‘Sugar Bun Sisters’. As I’ve already eaten Pancake Corner’s food and being a huge cupcake fan I headed over to Sugar Bun Sisters. Many of their cupcakes have fun names with a Manchester edge such as “Twisting My Lemons”, “Manc-Teaser” (topped with Malteasers of course!). They’d obviously been busy as they’d already sold out of several flavours including Oreo which was my first choice. I chose 5 others including “Choc-Work Orange” (filled with chocolate orange ganache and topped with a segment of chocolate orange) and “Artful Dodger” (vanilla cake filled with strawberry jam topped with vanilla frosting & a Jammie Dodger!). I can’t remember the name of the other 3 but there was a double chocolate one, one tipped with a Refresher lolly and another apparently made with vodka, although I couldn’t taste any. Needless to say they all tasted as good as they looked and were demolished in a matter of minutes. We were full to bursting by this point so I admitted defeat. At least until I saw the Tea & Crumpet Emporium, well you don’t get to buy homemade artisan crumpets from a man on a tricycle every day do you? The crumpets where baked with interesting fillings inside them such as ‘Cheese & Chorizo’ and ‘Stilton & Onion’ but as we were in dessert mode we went for the sweet option ‘White Chocolate & Raspberry’. The crumpet itself was incredible, nothing like the spongy shop bought versions, I’ve been meaning to make my own for years and this might finally persuade me to do it although I fear they wouldn’t be anywhere near as good. The raspberry filling was quite subtle but coming across one of the white chocolate chips was a real treat and we topped them with gorgeous homemade jams: ‘Blueberry & Rhubarb’ and ‘Strawberry Chilli’ flavours which were both delicious. A very pleasant end to a great day. 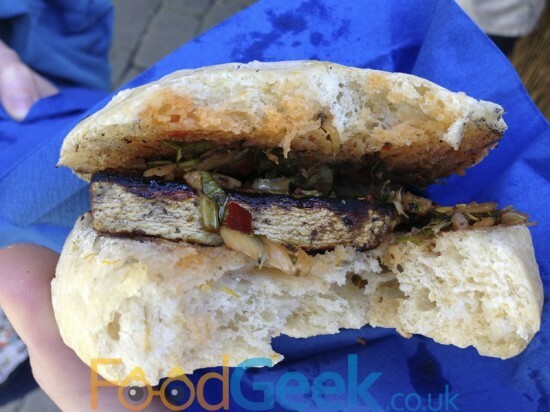 Guerrilla Eats was clearly a great success from the food to the weather, the organisation and all the traders. I had a great time and will definitely be looking out for future events. Previous: Delicieux Bolton. Great Pies, Even Better Cakes! Next: Koya Japanese Udon Restaurant, London – The Slurpiest Noodles In Town!